As part of her research on historic campus cuisine, CAP Fellow Susan Kooiman visited the MSU Library’s Special Collections Department to peruse their collection of historic cookbooks. As you can (and should!) read about in her blog post, she came across several interesting recipes while looking through regional cookbooks for dishes popular in the Midwest during the late 19th century. Curiously, every cookbook she encountered seemed to include dozens of oyster recipes: fried oysters, broiled oysters, stewed oysters, escalloped oysters, fricasseed oysters, pickled oysters, oyster croquettes, oyster patties, oyster pie, oyster soup, oyster toast. Nineteenth century Americans apparently ate oysters with beefsteak, oysters stuffed in turkey, oysters with scrambled eggs, even oysters with frog legs and Parmesan cheese. If they could think of a way to prepare oysters, they tried it. By all accounts, during the 1800s America was swept up in the midst of a “great oyster craze” (1). In this blog post, I address the question you never knew you needed answered: why were 19th century Americans so obsessed with oysters? Today, oysters are a somewhat divisive subject. Some love them, some hate them, and some refuse to try them. No matter how you feel about them, the fact is that Americans have a long-standing history with oysters. Oyster shells recovered from middens—or trash pits—indicate Native Americans have been eating oysters for almost 9,000 years. In the United States, one of the largest oyster-producing bodies of water is Chesapeake Bay. Reefs of eastern oysters (Crassotrea virginica) once dominated the area so prominently, legend has it that early colonists nearly ran aground on them. When European colonists arrived in the 17th century, they began to harvest oysters from Chesapeake Bay at a voracious pace. Until the 1800s, wild eastern oysters were typically harvested and eaten locally. Since oysters do not preserve long once out of their shells, oysters harvested from Chesapeake Bay rarely made it further than could be transported in a day. Nineteenth century advancements in food preservation and transportation transformed the oyster industry. Newly built railways connected the coast with inland cities and made it possible to ship oysters further west. Canning technology made its way to the U.S. in the early 1800s. By the 1840s, oyster canning became a booming business in coastal cities such as Baltimore. Canned oysters and fresh oysters packed in ice were shipped inland to Cincinnati, Cleveland, Detroit, Chicago, St. Louis, and other Midwest cities. Innovations in harvesting allowed for more efficient collection of oysters. Historically, oysters were collected by hand or with special tongs . In the 1800s, however, fishermen began to use dredges, iron mesh bags that were dragged across the ocean floor to collect oysters too deep for tongs. From 1880 to 1910, oysters were harvested in massive quantities. During this time, as much as 160 million pounds of oyster meat was harvested per year. This intensive exploitation did irreparable environmental damage, but it did create an ample supply of oysters. The fact that oysters were so abundant made them inexpensive, which only boosted their popularity. In 1909, oysters cost half as much as beef per pound. Oysters were used to add bulk to more expensive dishes such as meat pies. They were eaten at breakfast, lunch, and dinner, and by rich and poor alike. 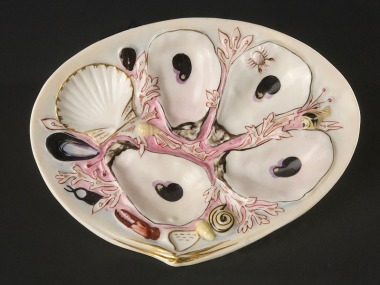 People even owned special plates for serving and eating oysters, shaped and painted like oyster shells. Because oysters were cheap, they were often served with alcohol at taverns and saloons. Essentially, oysters in the 19th century were served like burgers and fries today. Every town had its own establishment for serving oysters. Oyster parlors, oyster saloons, oyster lunchrooms, and oyster cellars lined the main streets of cities. These establishments became prominent and fashionable gathering places across the East Coast and Midwest. “The oyster, when eaten moderately, is, without contradiction, a wholesome food, and one of the greatest delicacies in the world. It contains much nutritive substance, which is very digestive, and produces a peculiar charm and an inexplicable pleasure. After having eaten oysters we feel joyous, light, and agreeable—yes, one might say, fabulously well” (Murray, 1861:13). We can only speculate on what he means by “inexplicable pleasure” and “fabulously well,” but who could resist such a fervent endorsement? Oysters were so popular and so ubiquitous that they were even eaten by students at MAC. As Susan found while looking through account books, canned oysters were purchased for students on occasion, including oysters and jelly at commencement, and 18 cans of oysters for students’ supper during the Week of Fires in 1871. So, there we have our answer: 19th century Americans loved oysters because they were trendy, cheap, and readily available for questionable culinary experiments. But this begs another question—why aren’t oysters as popular today? Whereas New Yorkers in the 1800s ate an average of 600 oysters per year, today Americans eat an average of less than three oysters per year. One factor affecting oyster popularity is that they are less abundant and more expensive now than they were historically. A combination of overharvesting and disease has depleted once-plentiful Atlantic oyster beds, decreasing the supply. Apart from reduced availability, public perception of oysters has also played a role in the oyster’s decline. At the turn of the century, the public began to take notice of the less-than-sanitary conditions in the oyster industry. In 1906, Congress passed the Pure Food and Drug Act, which required more stringent regulations for hygienic handling, packing, and shipping of food items. However, conforming to these new regulations raised costs so much that many oyster-packing houses went out of business. Bad press was another factor. In 1924, typhoid outbreaks in Chicago were tied to oysters exposed to sewage pollution. After this event, demand for oysters fell between 50 and 80% across the country. The 1920s also brought Prohibition, which took its own toll on the oyster industry as the saloons and bars that once sold large quantities of oysters closed. Between the loss of these establishments and various health scares, oysters fell out of fashion and have never fully regained their former status. As an oyster skeptic, I have mixed feelings about the prospect of oysters regaining the popularity they enjoyed in the 1800s. As for me, the next time I order bar food, I’ll take a bite of my burger and consider myself lucky I’m not slurping oysters between sips of beer. 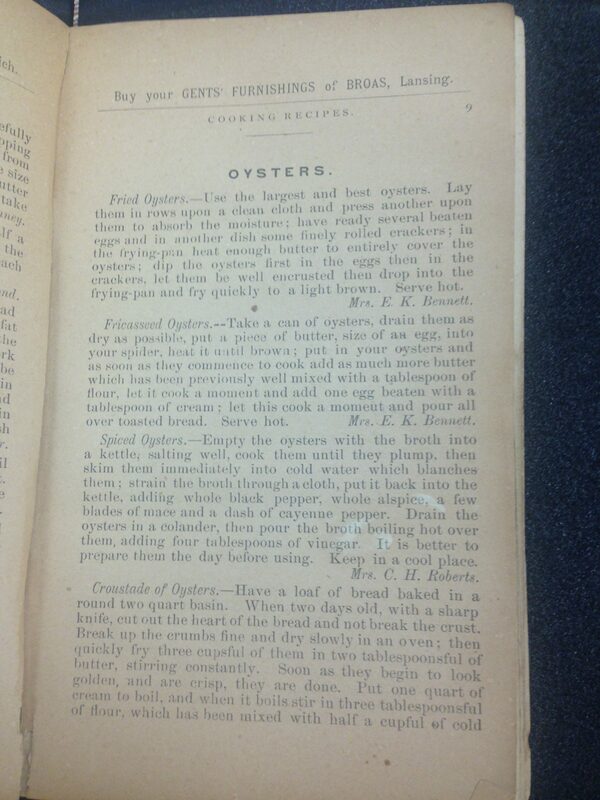 MacKenzie, Clyde L. History of Oystering in the United States and Canada, Featuring the Eight Greatest Oyster Estuaries. Marine Fisheries Review, 1996. 58(4):1-79. Murray, Eustace Clare Grenville. The Oyster: Where, How, and When to Find, Breed, Cook, and Eat It. London, Trubner & Co., 1861. As an oyster lover, I would only say that you can’t really compare today’s oyster eating decline to the 1800-early 1900s based on diseases and weary feelings of the product. I believe the author hasnt paid much attention to the large increase in oyster farming over the last decade, with more careful attention to craftsmanship and better farming techniques. The quality of farmed oysters has soared, and though more expensive than the 1800’s, regulations related to quality and safety make this bar food worth your while. In fact, I would be more concerned about the meat of the burger you’re putting in your mouth than an oyster any day. Meat regulations in the US are way behind the Shellfish industry. I think your opinion there is still treating Shellfish as some sort of major health risk when your red meat intake is linked to far worse. Lastly, the environmental benefits of farmed oyster reefs have been overlooked here as well. Oysters are filter feeders, and clean our waters, which has a hugely positive impact on our resources and the increased biodiversity of our tributaries. The oyster craze on the east coast and the west are contributing to amazing benefits to our shores. Thus, the more oysters you eat today, the better you’re helping the world around you. I’d give them another go, and I’d perhaps rethink what you consider a decline in oyster eating, and take a look at the changes in recent decades to support the increased success of Shellfish farmers. Thank you for your interesting insight into shellfish farming and oyster eating today. My intent with this post was to explain why oysters were so ubiquitously popular in the 19th century and why this popularity declined specifically at the turn of the century: public perception of oysters changed fairly dramatically during that period in part due to health concerns. I did not mean to suggest that consumption of oysters carries health risks today, only that I personally would enjoy pairing beer with burgers over oysters! Perhaps I will have to give it another try some day.